There are totally some things that we take for granted. Need to make cookies? Better put butter down on that shopping list! Well it’s so dead simple to make butter at home, and you know what? It’s a great way to prolong the life of that cream you can’t finish! Delicious, rich butter is only a few minutes away - all you need is a food processor, and 2 ingredients! Place cream and salt in the bowl of your food processor. Process till cream splits into grainy solids and a thin, milky liquid (the whey). Strain through muslin, or CLEAN chux/tea towel. Fold the edges of the cloth together and press out the excess liquid. CONGRATULATIONS! You just made butter. *Many recipes call for pure cream, but really. Any cream will do. I tried it with thickened cream because it was easier to find, and you get a great result still! How simple is this? I hope you enjoyed my guide on how to make butter at home! If you wanna see more yummy recipes, and more crazy food experiments, leave me comment below, and it may make it to the blog! I love the colour of your butter so golden. 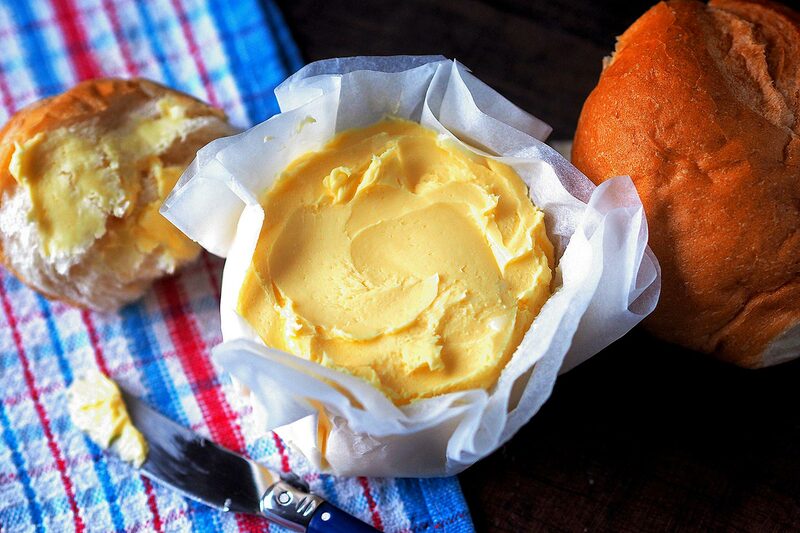 Butter is on my bucket list to make and well finally someone has made it simple enough to make. Thank you – will be trying this soon. Tammi I’ve never made my own butter, how crazy am I because I absolutely adore it!? This is crazy easy I have no idea why I haven’t made this before! I discovered your blog today. Nice recipes. A friend told. Me. To put a tablespoon of yogurt into the cream and live it overnight at room temp. Then beat the cream into butter. It mimics partially the taste of matured butter. (he also mentioned to remove the extra moisture to keep longer using ice water).